Sunday and Monday evenings saw outbreaks of street violence in the German city of Chemnitz. 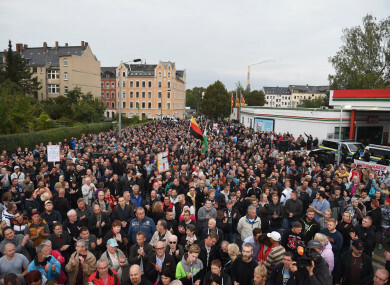 GERMAN FAR-RIGHT demonstrators gathered in the eastern city of Chemnitz to protest Chancellor Angela Merkel’s immigration policy this evening, but there was no new outburst of the violence that followed a weekend knife killing. A crowd estimated at around 1,000 people by news agency DPA waved German flags and listened to speakers attack Chancellor Merkel and the news media over their handling of crimes committed by migrants and refugees. “When we see everything asylum seekers get compared with old people, poor young people, Germans, it’s not surprising that people explode,” said Tobias, a local man in his 50s who asked not to be named in full. The group planted itself outside a town hall-style meeting where Saxony state president and Merkel party colleague Michael Kretschmer faced a grilling of his own from angry voters, who accused him of not doing enough for the region. Sunday and Monday evenings saw outbreaks of street violence, triggered by the arrest of one Iraqi protester and one Syrian. The two are suspected of stabbing 35-year-old carpenter Daniel H to death after what police called an “altercation” in which three other men were wounded less seriously. After being heavily outnumbered by thousands of neo-Nazis, football hooligans and other extremists, police called in reinforcements from other states and federal police today. “We won’t tolerate hooligans and violent far-right criminals taking over the streets,” said regional interior minister Roland Woller. In another violent hate crime overnight on Wednesday in the ex-communist east, a 20-year-old migrant was subjected to xenophobic insults, and kicked and beaten with an iron chain by three men in the Baltic coast city of Wismar, police said without giving his nationality. Images of the Chemnitz violence went around the world, but demonstrators gathered under a banner reading “the people are rising up” chanted “lying press!” as a speaker denounced the TV footage. The sight of protesters making the illegal Nazi salute in front of police officers was “shocking”, said UN human rights chief Zeid Ra’ad Al Hussein. Meanwhile, Christoph Heubner, executive vice-president of the International Auschwitz Committee said that “Holocaust survivors are watching the attempt by far-right groups to seize power over the streets and bring hate into cities with growing concern”. Even worse for local authorities in Saxony state are signs police officers and other officials may have colluded with far-right elements. Crimes by immigrants are routinely seized upon by far-right party Alternative for Germany (AfD) and street movement Patriotic Europeans Against the Islamisation of the Occident (PEGIDA) who label Merkel a “traitor” for allowing them into the country. AfD leader Alexander Gauland told Die Welt daily that “migration is destroying the feeling that you can trust your neighbour”. Anti-immigration groups plan a “silent march” on Saturday for the stabbing victim in Chemnitz, an AfD party stronghold. Under Merkel, Germany has welcomed more than one million refugees since 2015, many of them from conflict zones in the Middle East and Africa, but her government has increasingly tightened asylum laws as conservative and far-right disquiet has grown. Email “German far-right demonstrators hold further protests, but no new outbursts of violence”. Feedback on “German far-right demonstrators hold further protests, but no new outbursts of violence”.